Fishing is no wonder an amazing time pass when you have nothing to a do or have a bad mood for no reason. Once you are near the water, trust you will feel refreshed and you will be busy with catching fish with lots of energy and excitement. Here I will talk about the most popular spices, the largemouth bass fishing tips. This largemouth fish is available in all kinds of water like ponds, lakes, rivers, canals and even in ditches. These all water source is perfect for bass fishing. What is so special about this big mouth fish? This fish is easy to catch and guess what for, the BIG MOUTH. Yes, this large mouth is the main fact that anglers get ready to catch this fish. Bass fish loves to eat and this fish eats anything. They like tiny zooplankton to snakes, duck, mice. Anything. But best prey for bass is crawfish and prey fish. All you have to do is presenting the lure as crawfish, which the bass loves most. The lures are not crawfished like if you give the look as one the fish will not able to recognize it. They will fall for the prey by the look and the vibration you will make while catching. If you select the perfect largemouth bass fishing lures then your fishing will be a success one. The largemouth bass in the US is available in Texas, Florida, and California. The big fish are tough to catch, as the water surface of the areas receives heavy pressure. The best places to target the largemouth with 100% getting a catch is in Mexico. El Salto and Lake Baccarac is full of this big largemouth fish. You will see them in plenty. Soft bait :- This bait is the best lure for largemouth bass. With this bait, you can lure the fish in any point and get a great catch. Weedless jig:- It is popular for its look and hook. This lure looks like a crawfish and bass loves crawfish. You have to move it and toss it in the water. Better to use in the summer time when the bass is out from their hide out. Jig Worms:- This lure is best in the dark time. Just place the lure in the water and wait for it to bring a fish near to you. Spinner baits :- If you want to fish in deep down, then use this lure. This bait helps the line to reach the waterbed. Crank bait :- With this bait, you will get the best result. Use them near the hideout of the bass and wait for the time to come out from the hideout. If you can place it well then it is a must that you can catch fish. Swim baits :- This baits best feature is tail shaking. When you use the tail in the water and move it, your boat will be full of largemouth bass. Yes, I will give you some tips, which will help you when you go for fishing this largemouth bass. Fishing bass is easy but needs some techniques to catch it. Whether you are new or expert, you have to apply some techniques while catching bass fish. Weather is the main trap to catch bass fish. How? Well if you do, some little study about bass fish habits you will know the habits of the bass in the weather. Like if it is summer time and the sun is hot and shiny, the bass fish will go for shelter. And when it is cloudy or no sun is heating up there, then the bass comes out from their hideout. So, you have to select the time of the weather when a bass is going toward their hideout. If you are near the hideout, it will be easy for you to catch the bass fish in plenty. And you have to be ready with lures when you spot the fishes are coming to hide. For fishing bass, the best tips find the spot where the fish will stay for sure. The fish loves to stay in the cover area like boat, rock, grass, wood. They love to hide here. So try to look for such spots when you are ready to fish the largemouth bass. It is important to be a good fisherman. If you don’t upgrade yourself into a versatile fisherman then it will be tough for you fish in every water surface. Try to fish in every water condition, as bass fish is available in any water you name. This will help you to use different techniques while fishing and your skill will develop. A knot is very important to catch a fish. If your knot is not proper then you are not eligible to catch bass fish. Because the largemouth fish gives a tough fight when you catch them. If your hook is not properly knot then it is a high chance to lose the fish. So learn to tie the knot properly. Clinch and Palomar knot is the best knot for catching bass fish. Use the right fishing rod. You don’t need to use a heavy rod to fish bass. You can use a lightweight fishing rod to get a great catch. You have to use the proper hook and right bait to catch the largemouth fish. If you do some research on bass fishing, you will know about the buzz bait lure. This bait is very popular because the catch with this lure is 100% guarantee. This bait has noise that is very loud and attracts bass fish far from distance. Bass fish comes fast towards the bait. Try to select the perfect time for catching largemouth. The best time is after sunset and some hours before sunrise. The bass loves little darkness and this time they are hungry for any food. This is the perfect timing to set up your bait and start fishing. The best time for bass fishing is the largemouth pre-spawn period. When it is spring and the water temperature is 55 to 65 degrees, the pre-spawn starts. While pre-spawn starts, both male and female bass fish goes to a narrow area. Then the fish starts eating viciously and get in the search for the best place to mate. This period is best for the catching the big fish as they are easily spotted. But if you catch female bass, do release it. Because they are responsible for letting life cycle to continue. If you really want a great catch then try to examine the food of the bass after catching one. How? Well when you catch a bass, the fish keeps fighting and throws everything out from the stomach. You will see the feedings of the fish. If you can then make a look alike bait after seeing the food. This will help a lot. If you like to use live bait then look the food they eat and collect them. While fishing it is common to put the line on different surfaces like branches, rock, stumps, and gravels. These surfaces sometimes, do harm in line and your fishing experience will not be good. So make sure while catching the largemouth bass, make sure the fish line is strong and thick. Some may think the size of the bait matters while catching the big mouth. But the fact is it is not really matters. The fact really matters is how you represent the bait for the fish. Some angler does not like live baits. But if the lure isn't able to help you in catching then you should go for the live bait. The live bait really works. You can use shiners, crawfish, worm, frogs and also slip bobber as live bait for largemouth bass fish. If your plastic lure is shredded then don’t waste it. You can use them as bait. Because likes to see wounded prey. So if any of your prey is torn, then tear it more. And set it in shallow water. You will see the magic. Shallow water is full of stumps and woods. Take this chance and make a bait with pink or red head or a crank bait in red hook. This red fools the bass fish, as it is wounded bait. Bass fish then attacks the bait and you have it on the boat. While casting, don’t swing the bait on to a target. Place the lure half feet before the target. This act makes the fish eager to bite. As largemouth bass has jaws with bone, then you need a sharp hook to catch the fish. If the hook is sharp, it will not take a time to catch fish. If you want to know more about largemouth bass, then put them in a live well. You can observe their doing, eating habit. This will help you to make any kind of bait you need. Bass fish swim with wind flow. Observe the wind and guess which way the current is flowing. Sail your boat little far from the place you can guess the fishes are. Then cast the bait. 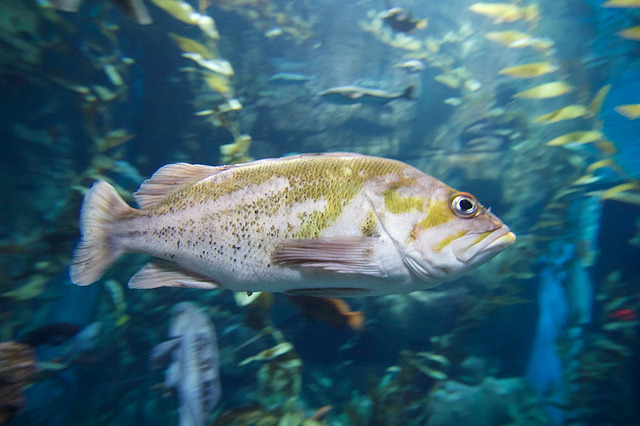 The eating habit of the bass is little different from other fishes. This fish likes crawfish in the early year and shad in summer or fall. So use peach color bait and silver bait to lure the largemouth bass. Yes just before the storm comes, it is a high time to get plenty of bass fish to catch. The weather makes the fish active and the look for food crazily. But after a storm, you will not get any fish. Bass fish is a moody fish. It takes a time to get the bait because of its mood. If the fish is happy with the bait look it will not take a time to take the hook in mouth. But if it is upset, then you have wait to catch. As the bass fish is sometimes tough to catch. Then try to be patient while catching one. Don’t lose hope so early. When you are sure that the place is full of bass fish but you are not getting the bite, then don’t move. Sit there and try every technique and bait to lure them to have a bite. Don’t stick to the old method for fishing. Try new lure in every catch. If you can try to make a new bait after observing the food habit of the bass fish. All this technique will help you to grow skilled and versatile angler as the bass fisherman. Fishing the largemouth bass is easy and not easy. Easy is because when you know the largemouth bass fishing tips and techniques, then you will catch fish easily. But if you don’t have followed the tips then it will be quiet tough for you. Bass fish is not a calm fish. It is very tricky and nutritious fish. They can fool you if you don’t stay alerted. You may think why is largemouth bass is so popular. 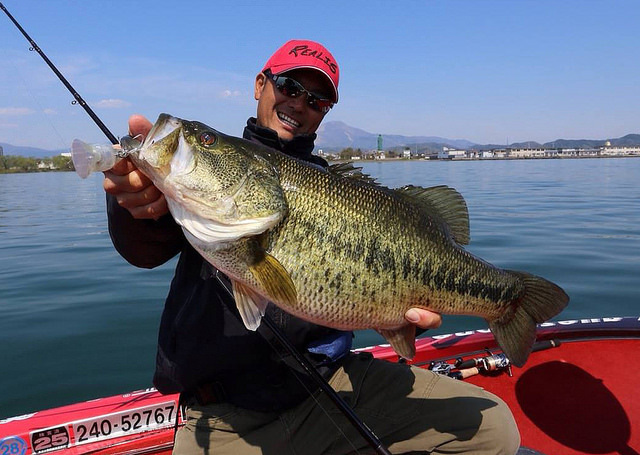 Because this fish is aggressive, you will get a tough fight while catching. Many enjoy this fight. Also, this fish is easy to find for its availability and surviving habit in all water surface. If you know the habits of a bass well then your fishing experience will be a memorable and your grandchildren will enjoy your stories of fishing.